HomePro-Am follow-upMeet some of the volunteer astronomers! Since the start of the campaign on 19th June we have had over 15000 photometric observations logged to the AAVSO database for our three target stars from volunteer astronomers all around the world. Access to the AAVSO database of photometric observations is freely available to anyone online and light curves can be generated using the AAVSO light curve generator. An example of the excellent work carried out by some of the observers is given below, with a light curve of Ross 154 captured on the night of 12th July showing a large flare. AAVSO generated light curve of Ross 154 showing flare captured on night of 12th July 2017 (Julian Date 2457947.8). So who are these intrepid observers? What motivates them? And how do they carry out their work? We decided to ask some of them to find out. I first spoke to the Belgian astronomer Franz-Josef (Josch) Hambsch. My interest started about 45 years ago as a child getting an astronomy book and binoculars. Can you give any details of your observatory and the equipment you use? I have a remote observatory in the Atacama Desert in Chile. The main instrument is a 40cm telescope. In fact I have a paper containing full details of my equipment which can be found here FJH Observatory. What were your motivations for joining the campaign? With my private observatory in Chile, I can accommodate lots of stars, hence my contribution. I am also looking constantly for collaborations with professionals. Can you comment on the photometric data you have captured? I know I have observed the same flare as ASH2 as my location is just a few meters away in San Pedro de Atacama at SpaceObs. I have only quickly looked at the data so far as I have a daytime job and do not have the time and means to intensively analyze my data which will be the job of the full time astronomers. What are your thoughts on working with the AAVSO and pro-am collaborations? I am an AAVSO member since about 2010 or so. It is a great organization with lots of enthusiastic staff. I had numerous conversation with them and participated in several meetings already. I will also join the upcoming 106th meeting in November in Nashville. Due to my possibilities at my private observatory in Chile, I have submitted the most data of all members and non-members. I have good relations with Stella Kafka the AAVSO director also with Arne Henden the previous director. I have am also been involved in many pro-am collaborations as you can see based on the publications which I have been a co-author of on ARXIV and can be found here: co-authored papers. 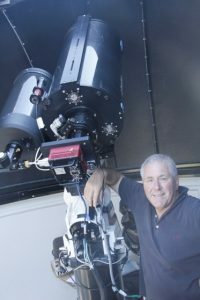 Next I spoke to Peter Nelson who works from his observatory in Southern Australia not far from Melbourne. Peter, how did you become interested in astronomy? I became interested in astronomy when I was maybe 5 or 6. On summer nights my mother and I would sit out under the veranda an look at the stars. Mum used tell stories about the stars which I eagerly believe. I suspect now she just made them up! I have two observatories at Ellinbank. 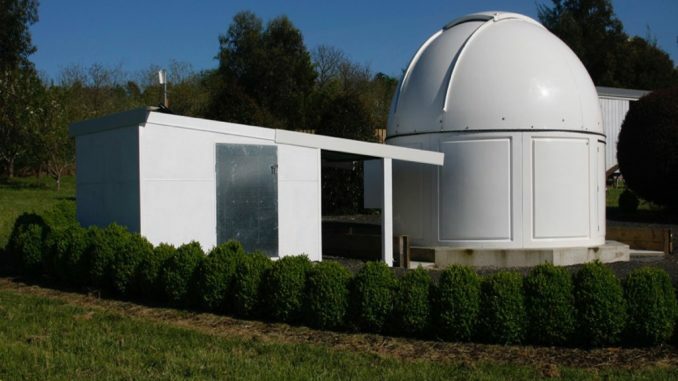 The main observatory has a 12.5 inch corrected Dall-Kirkham telescope and the other the Bright Star Monitor (BSM) south observatory I run for the AAVSO has an AstroTech AT 72mm refractor operating in it. Further details of my equipment can be found on my website www.ellinbankobervatory.com. Can you tell me a bit about previous campaigns you have been involved in? I have been doing photometry for a long time. In 1989 I became involved in photometric timing of Jovian eclipses with Anthony Mallama (USA). This was a very interesting program and ultimately refined the Galilean satellite positions to around 15-20km, previously 600km. 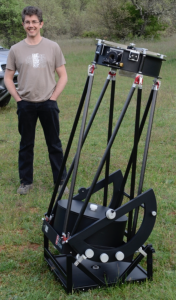 Since 2014 I have been involved in Kilodegree Extremely Little Telescope (KELT). In both cases there has been constant feedback from the researches and this has been most rewarding. What has been your motivation for and experiences on working on the Red Dots campaign? As an amateur, working with you is a huge motivation. There will be nothing better than seeing a paper which you have contributed too. My experiences collecting data for this project have been mainly battling winter cloud. It would be great to have weeks of clear weather! Finally we meet Marc Deldem an astronomer who has an observatory in Provence in the South of France. Could you tell me a bit about how you got involved in astronomy? I have been interested in astronomy since the age of 10 years. In 1993, I joined the Montpellier Astronomy Society (Société d’Astronomie de Montpellier), an association of amateur astronomers in the city of Montpellier, in the south of France. This association has an astronomical observatory named Pises Observatory (L’Observatoire des Pises) located in the Cevennes National Park, in a dark place without any light pollution. This same year of 1993, I bought a Schmidt-Cassegrain C8 telescope on a SPDX mount to do some visual observations. 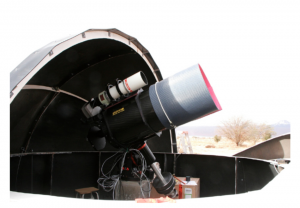 In 1995-96, at Pises Observatory, we started to work with the first homemade CCD camera. The shift from photographic film to CCD detectors was a great revolution. Later, in 2009, I bought my own astrophotography equipment (a better mount, a CCD camera) to use with the C8. My current equipment is constituted still with my “old” C8, a SBIG ST8-XME CCD and its filter wheel, a Losmandy G11 mount with the Gemini2 controller, and an Optec focuser. I started CCD astrophotography with my own equipment in 2009. At this time, I had to go to observation sites 50 kilometers away from my home. All the night under the stars it was great times ! And where is your current observatory? In 2014, I bought a house in Provence, in south of France. I made a simple home observatory in my garden, named Les Barres Observatory. And last but not least, in 2015, I received my MPC code observatory K22. At the end of 2014, after a conference on amateur exo-planet detection with the transit method, I tried my first measurement of an exo-planet. This was a failure, a beginner’s error, the detector was saturated. I tried again in 2015 with a successful measurement of TrES-3 b. I was very enthusiastic when I was able to see the light curve on Muniwin software. Since, I done several measurements and all the results are published here on the ETD Exoplanet Transit Database. In the night of 15/01/2016, I participated in a collaboration pro-am. Alexandre Santern, a french astronomer, asked the community of amateurs to confirm the transit of the exo-planet EPIC211089792 b. It was a great success, many observateurs have replied and shared their results in live. Very exciting ! All the results were published in the ARXIV paper. In June 2017, a French astronomer Julien Maurin, co-discoverer of the exo-planet Proxima b, gave a lecture on Proxima b and spoke to us of the Red Dots initiative. And here I am taking part in the campaign! We would like to thank all the observers who are taking part and contributing their observations to the AAVSO database. In the future logs we will continue to find out about some of our volunteer observers and have a further look at the data they have been providing.